I bought this guide just before visiting Dartmoor and Cornwall for the first time in 2012. I would usually be content with borrowing a guidebook from the library, but as one of my sons lives in Bristol and I occasionally meet up with him in Bath, it seemed like a book worth buying since I would continue to use it in the future. Right at the beginning, the guide has a double-page map in colour; the area it covers extends to the Pembrokeshire Coast National Park in the north and the New Forest in the east. To avoid confusion, the area actually covered by the guide is shaded in grey. Major cities, towns and attractions are shown, and these include Torquay, Bristol, the Isles of Scilly, Corfe Castle and the Eden Project. An eight-page section of colour photographs follows; included here are Exeter Cathedral, St Michael’s Mount, the Lizard, Glastonbury Tor and fossil hunting on the Jurassic Coast among others. 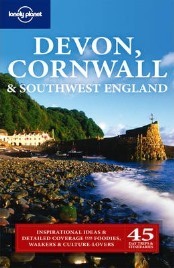 The only other photographs in the book appear in another eight-page section in the middle, entitled “Best of the Southwest.” Featured here are outdoor attractions like the South West Coast Path, food and drink delights such as Devon cream teas, and rainy day activities such as the Eden Project and the Thermae Bath Spa. The first section of text cover topics such as history, itineraries, the environment, culture, outdoor activities, and food and drink. In each section the whole area is considered, but the remainder of the guide is divided into four geographical sections. The first of these deals with Bristol, Bath and Somerset together, and the other three look at Dorset, Devon and Cornwall individually. The main destinations and their surrounding area are looked at in terms of attractions, activities, accommodation, eating out, entertainment and getting around. There are black-and-white maps of counties, areas such as Exmoor National Park, and towns and cities including Bath, Bristol,Torquay, Plymouth and Exeter. The guide ends with a directory and a glossary, as well as information on health and transport. I haven’t taken this guide with me on visits to either Bristol or Bath, but having been to both cities several times I can safely say that the book would certainly be useful to a first-time visitor. The map of Bristol is on a fairly small scale, but I have walked from Temple Meads station to Bristol City Museum and I could easily follow the route from the Lonely Planet map. While the guide mentions some of my favourite haunts such as the Clifton Suspension Bridge and the Arnolfini Arts Centre, it has given me ideas for other attractions to head to on future visits. I was happy to see the Firehouse Rotisserie listed among the restaurants in Bath, as it is one of the few places that stays open throughout the day and we have enjoyed a meal there more than once. I did take the guide with me to Dartmoor and Cornwall last year and had it with me when I was wandering around St Ives on my own. Lonely Planet obviously feature attractions such as Tate St Ives, the Minack Theatre and the Barbara Hepworth Museum, and I was pleased that they included the Rugglestone Inn among places to eat in Widecombe-in-the-Moor as we had an excellent meal there. It was disappointing, however, not to find the Navy Inn in Penzance mentioned, as we enjoyed the best fish we’d ever tasted there. An omission in places to stay is the delightful Kemps Country House Hotel near Wareham in Dorset, but thankfully the Dunedin, where we stayed in Penzance, is listed. The Eden Project has a relatively detailed description in the guide, but I was surprised that the town of St Austell is not featured as such. The guide does seem to give quite a lot of information about outdoor activities and activities that would appeal to children. There are also features aimed at gay and lesbian visitors, and right at the end of the guide is a GreenDex page that lists accommodation, eateries and sights and activities chosen for sustainable tourism. The Lonely Planet guide is a little heavy to carry around all the time, although I did take it out with me on one occasion when I had little else to carry. That day I had it in a small plastic carrier and the heavens opened, but thankfully the paper is of good quality and the book stood up pretty well to a soaking in one corner. While the font is quite small, I find it easy to read. All headings, subheadings and names of establishments are in bold, and contact details and prices are given along with descriptions. I would certainly recommend this guide, unless you particularly want a book that has a host of photos in colour interspersed with the text. The lack of an entry for the town of St Austell does seem to me very strange, but on the other hand I know I can’t expect to find all my favourite restaurants in a guidebook. This is a comprehensive work for those who still like to have a traditional book to refer to, and I expect that most people would find the maps more useful than a large number of photos. No Comments on "Lonely Planet Devon, Cornwall and Southwest England"